Eating foods like deep-coloured berries, red beets, and tomato sauce. Ageing—Surface enamel wears down over time, exposing the layer of dentin underneath, which typically is more yellow in colour than enamel. 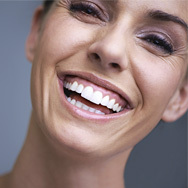 One note: What makeup you wear can make a difference in how white your teeth appear. Blue-based red lipsticks make teeth look whiter, white- or yellow-based or light pink colours can make them appear more yellow. This can be the case even if you’ve had your teeth whitened! It’s also important to be realistic about your expectations when it comes to teeth whitening. Whitening products will work only on natural teeth, so if any of your teeth have crowns, porcelain veneers, bonding materials, and so on, you might wind up with unevenly coloured teeth.